Not too long ago, I took the carpeting off our stairs. The carpet was nasty dirty. It was dingy. When I took it off the stairs, I had to vacuum as I went because it was so yucky. I talk about that whole project in this post. The wood underneath the carpet was in remarkably good condition. Gorgeous in fact. I love, love the way that the stairs look with just the wood and no carpet. No carpet. Right. Enter: two big dogs. The dogs are slipping on the wood stairs. Hank, our Golden Retriever, who is less than coordinated anyway, has fluzzies (technical term) on his paws and that makes him slip. Bear, the Dog Who Doesn’t Eat Pizza, just can’t get any traction on the wood. They are both doing Scooby Doos down the stairs and I am seriously afraid that one of them is going to break a hip. You secure them to the stairs with carpet tape. While that would solve the dog slippage problem, they are very utilitarian-looking; not so decorative. I’m going to return them because I just don’t like the way they look on the stairs. So now I’m stuck. 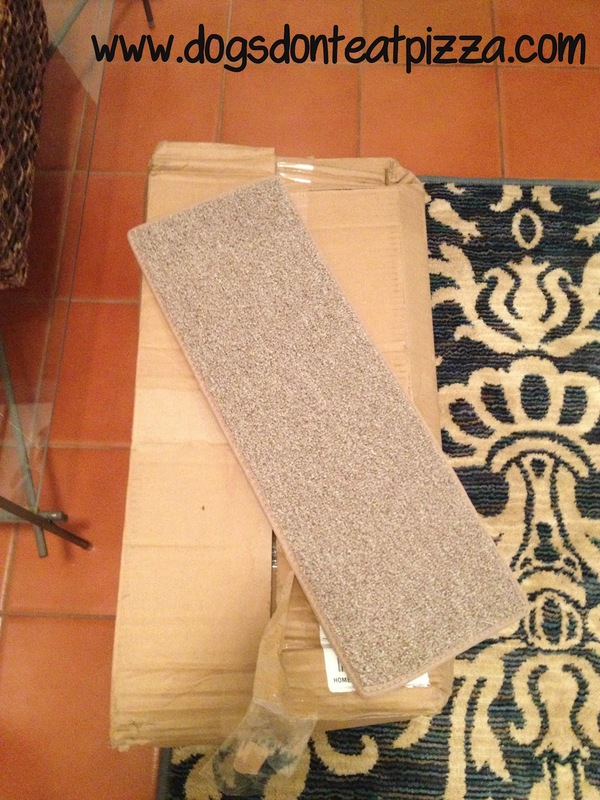 A carpet conundrum, as it were. I have to put something on the stairs. I am not a big fan of runners, because they are usually a bit too traditional for my taste. So, I either need to find a less traditional runner, or we need to put carpeting back on the stairs. Sigh. I’ve thought long and hard about this. Do I regret taking the carpet off the stairs? Absolutely not. The carpet was coming up anyway and it was terribly nasty horribly dirty. But I am feeling guilty about my furry kids and I don’t want them to get hurt. Anyone have any great ideas? Great sources for good-looking runners? Has anyone faced this problem before and solved it well? Anne, I am never moving ever again, if I can help it. 🙂 Thanks! we have stairs with no carpet, and a dog– and i have lots of friends with the same (most houses in our area are all hardwood) and it hasn’t been an issue. i would guess the problem is your dogs are used to the carpeted stairs they can fly down and are just going way too fast for the slippery wood. 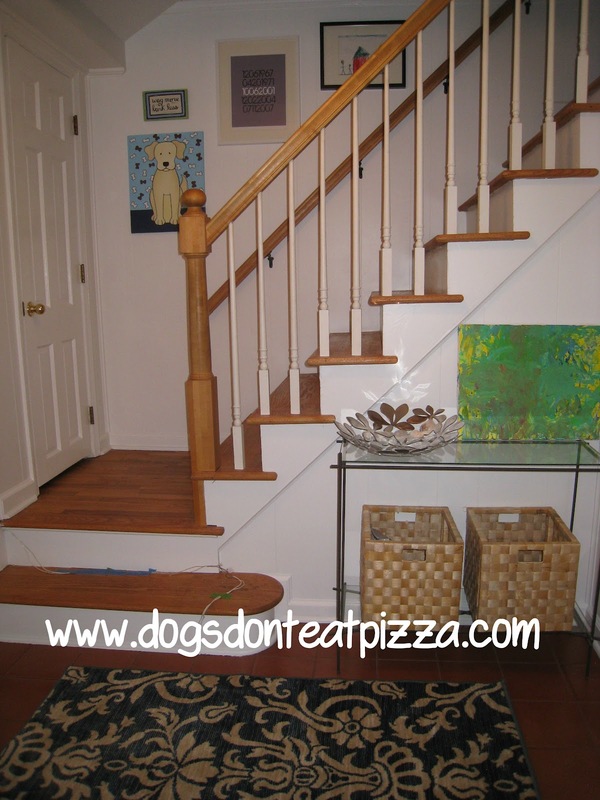 would you consider putting the dogs on the leash and trying to teach them to go down the stairs slowly? Hilary, That’s a great idea. I’ll try that first. Would certainly be cheaper and more attractive than carpeting the stairs again! Thanks! Thanks, P. I appreciate it. That would be great. 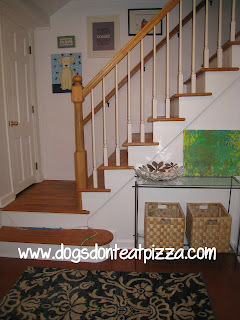 So, I ended up using sisal stair treads, which I show and explain here: https://www.thediybungalow.com/bare-stair-problem-solved/. I ended up not really loving them, so I installed a runner on the stairs…which I thought I had blogged about, but it turns out I didn’t! 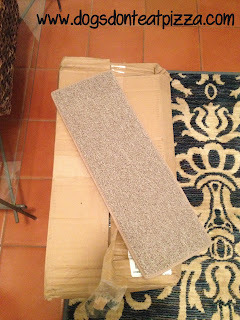 So, next week, I promise I will write a DIY post about how to install a stair runner! 🙂 Thanks, Lynne!